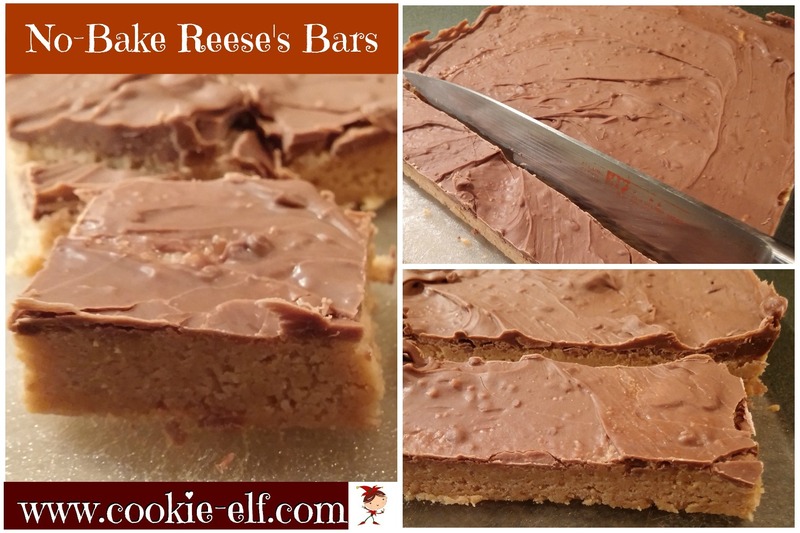 No-Bake Reeses Bars combine two great flavors – milk chocolate and peanut butter – producing a taste and texture that is a clone of the ever-popular Reese’s Peanut Butter Cups. The trademark milk chocolate-smooth peanut butter combination was fathered by H.B. Reese in 1928, who began producing his peanut butter cups and other candy in his Hershey, PA basement. Reese’s have become the best-selling candy brand in the U.S. These bars, more a confection than a straight-up cookie because they are not baked, mimic the popular Reese’s Peanut Butter Cups save for having just one layer of chocolate, rather than two. They contain no flour, making them a favorite among the gluten-free crowd. To top it off, they are incredibly easy to make and have just 7 ingredients. Line a 13 x 9 baking pan with parchment paper, allowing ends to extend over the edges of the pan. Set aside. In a large bowl, using an electric mixer on medium speed, cream together melted butter, graham cracker crumbs, brown sugar, powdered sugar, peanut butter, and vanilla until well blended. Pour dough into prepared baking pan. Spread it out evenly. Score bars into bite-sized pieces before chocolate sets. Chill bars in the refrigerator 30-60 minutes or longer until they are set. Lift ends of parchment paper to remove bars from the pan. Re-cut bars carefully along scored lines. Remove bars from the pan. Place waxed paper in between layers to store them. You can purchase graham cracker crumbs ready to use in this recipe or crush your own. For an easy, no-mess way to measure peanut butter, coat the measuring cup with cooking spray before you spoon in the peanut butter. You can substitute semi-sweet chocolate chips for the milk chocolate chips called for in this recipe.